Increase the value of your home with a low-cost easily installed medallion creating a timeless focal point. Completely change the appearance of a drab or older style ceiling. A decorative ceiling medallion can really make a difference by adding a finishing touch to your light fixture. Medallions add dimension and texture, character, and vintage charm with limitless designs to match every d�cor style. And we offer the largest collection of designs to give you that special look you desire. Our sturdy medallions are made of the highest quality material, for a fraction of the cost of traditional plaster or wood. Our green, environmentally friendly material can be painted, gel stained, marbleized or faux finished making it ideal for a variety of interior and exterior applications. Easy installation using common woodworking tools and adhesive, provides a dramatic change with instant elegance and personality. Add luxury and attractiveness to an average ceiling fan, uninspiring light fixture, or get creative by mounting them on the wall for an innovative look. 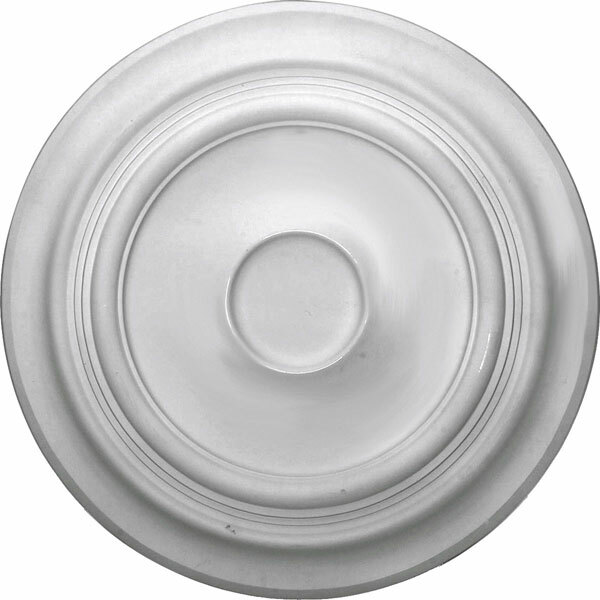 We offer two-piece ceiling medallions for ease of installation and abstract design options as well. With more than 400 styles to choose from and simple installation we are sure to have the perfect medallion to inspire a new project for the designer in you. You are only a few short steps from transforming the look of your room. Medallions are one of the few products that can accentuate a wall, ceiling, or fixture with very little work. Made out of a lightweight and versatile composite material you'll have no problem installing this medallion, no matter what your application is. With both traditional and modern designs available, one of Ekena's medallions is sure to compliment your light fixture, ceiling or simply express your personal style. The most classic way to use a medallion is paired with a fixture or chandelier. It takes the look of elegance to the next level at a low cost and with easy installation. A new and exciting way to use medallions is as wall decor. By painting them complimentary colors it will take your wall to a new category and is sure to turn some heads. Ceiling fans offer both design and function to a room but rarely do they have a stylish canopy. By installing a ceiling medallion you'll enhance the look and style of the room. Apply construction adhesive to the back of the medallion and push it in place. Fasten the medallion in place using screws or finishing nails. Finish the medallion however you'd like and you're finished!